While Netflix’s video streaming service only offers 10,000 movies and TV episodes compared to the 100,000 titles available via DVD, the company’s all-you-can-eat subscription strategy is the right one, and differentiates it from an increasingly crowded market of pay-per-view offerings. A market which, CEO Reed Hastings says, the company has no plans to get into. “We don’t plan to enter the pay-per-view segment, where Apple, Amazon, Sony and others focus”, Reed told shareholders and analysts during Friday’s second-quarter earnings call. He also ruled out an ad-supported offering too, where, for example, Hulu and YouTube compete. “Both of those segments will likely be substantial, but our subscription segment will also be large and will provide Netflix plenty of room for growth”, says Reed. The problem with the majority of pay-per-view online video services, both rental and to-own, is that they remain prohibitively expensive, often costing equal to a physical DVD, and in some cases more. 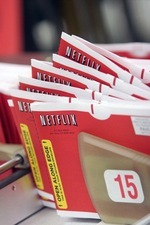 In comparison, Netflix is offering streaming at no extra charge to members who are already on a high enough DVD tariff, and in the longer term is protecting the subscription model which it helped pioneer.